A fire has broken out on the Carnival Triumph which is currently undergoing a major transformation in Spain into Carnival Sunrise. 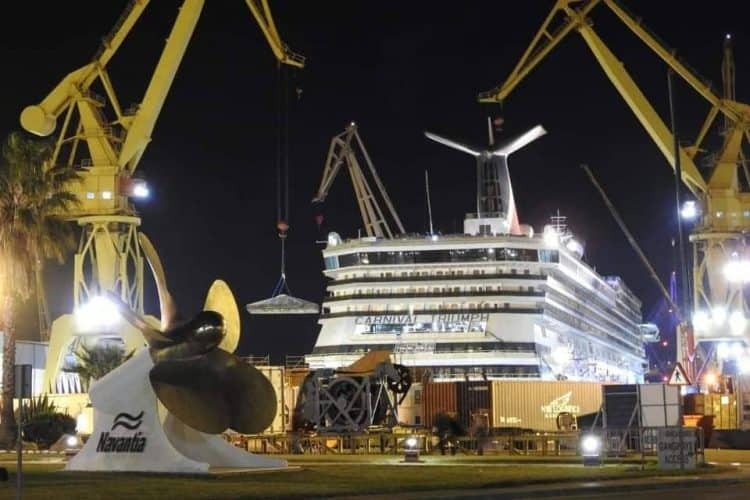 There are multiple reports that a fire broke out on the Carnival Triumph cruise ship during dry dock in Cadiz, Spain on March 22. As a result, hundreds of people were evacuated from the vessel including workers, contractors and crew members. The news was first reported by Mondo Navi forums and according to the site, the fire started on deck 4 starboard side near the bow area. A spark may have ignited the fire during some welding work onboard. The shipyards own fire crews responded and it was later extinguished. The large Navantia shipyard would have been fully prepared for these type incidents and ship would have already practiced an evacuation procedure once it arrived at the dry dock. Thankfully there are no injuries reported and the photos which are being posted on social media looks a lot worse than it was. It’s not clear how much damage was done to the ship and if it was mainly materials onboard. As the fire did not spread much further no delay of the renovation is expected and she will still continue to be transformed into the all-new Carnival Sunrise. The Carnival ship first entered dry dock on March 12 and is being upgraded with new features and enhancements. The upgrade is costing the Miami-based cruise line $200 million and it involves almost everything being ripped up and outfitted again over the two-month period. However many staterooms already started being renovated weeks be before while Carnival Triumph sailing her final cruises. The newly upgraded vessel will debut with a new service sailing out of Norfolk, Virginia on the U.S. east coast. The first voyage will depart on April 20, 2019. The vessel is 101,500 gross tons and has a guest capacity of over 2,700. Just days ago we posted about a fire which broke out at another shipyard. During the construction of Costa Smeralda which is the largest ever Costa cruise ship, a fire broke out on deck 15. As a result, the entire ship was evacuated and there were some minor injuries. You can read it right here.